During those early days, when they didn't have any contact with then modern world, they invented their own calendar which had calendar which was very close to our present calendar..
Wayna Picchu (Huayna Picchu or Young Pick) is the mountain you see behind Machu Picchu. Towering above the north end Machu Picchu is this steep mountain, often the backdrop to many photos of the ruins. This mountain is steep, but stone steps are laid along most of the part and also where the mountain is steeper, you will find steel cables as supporting handrail. So for fit persons it is still not that difficult. During wet days you have to be very careful as things turn out to be difficult very quickly. Only 400 people are allowed to hike Wayna Picchu each day. You have to sign in at entrance gate. The first 200 numbers are released at 7:00am, and are often gone in less than an hour on busier days. The second 200 are available at 10:00am. Some time if you are lucky you may register your name even at late afternoon. 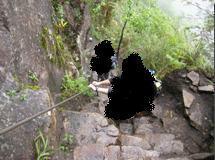 People who signed earlier may not show up to hike Wayna Picchu after tiring visit of Machu Picchu ruins. So if you are late and still want to hike Wayna Picchu, try and check whether they have space for you. Remember you have to come back from hiking by 4.00 pm. Also when you sign in try to remember your number, as you have to sign out with these number. Beautiful landscape on your way is breath taking. There are some ruins near the top. You may like to visit them, not much interesting though. They is another path to hike down around those ruins, but this path is a bit difficult with some shallow and very steep steps, so it is better to avoid this path. So you should use the same path to go back. Most important thing about Wayna Picchu is you will enjoy the birds eye view of whole Machu Picchu from the top. Reaching at top and looking down from there is really special. Huayna Picchu or Wayna Picchu is 1300 ft (400 meters) high from Machu Picchu ruins and located at north side (there is no way to miss it though). Altitude of top is 8750 ft (2670 meter). The area at top is around 2100 square ft (200 sq. meter). Usually it takes around a hour to reach the top and another 40/50 minutes to comeback. You will be glad to see that the path is almost two meters wide, but at the beginning only. later it becomes narrower, and mind it, one side of the path fall to a deep gorge. There are many accidents and most cases body was not found. After a while you will find the path is becomes rally narrow - only several feet wide and here the slope is really steep, making this root unsuitable for heart patients. Through out all the way the rocks are uneven and sometimes they are slippery too. But the good thing is that you will see hand rails at those places.